Klaus Wittkugel/Anton Stankowski, Amt für information/Henkel, 1950/1952. This project focuses on the work of two key twentieth-century graphic designers within divided Germany—colleagues who worked on opposite sides of the Wall. 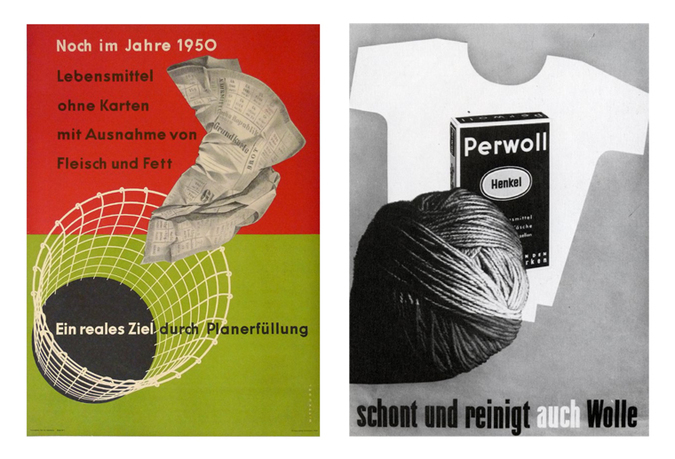 Klaus Wittkugel (1910–1985) and Anton Stankowski (1906–1996) led remarkably parallel careers as graphic designers before and after World War II; each eventually collaborated with the most prestigious and powerful clients of their respective contexts. 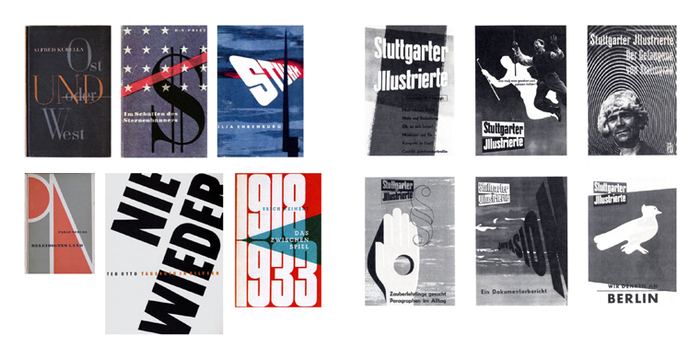 Wittkugel created notable design work including posters, book covers, and propaganda exhibitions for the East German state itself; Stankowski, on the other hand, created advertisements, corporate identities, and environmental graphics for West German corporations and commissioners, ranging from industrial manufacturers and trade boards to financial institutions such as Deutsche Bank. Presenting key pieces—once in graphic dialogue across state boundaries—from different time periods and media, the two parallel exhibitions seek to reactivate questions regarding the relationship of politics, aesthetics, and functionality within historical and contemporary design practice. Prem Krishnamurthy is a designer and curator. As a founding principal of the design studio Project Projects, he is the recipient of Cooper Hewitt Museum’s 2015 National Design Award for Communication Design, the USA’s highest recognition in the field. With Project Projects, he has collaborated with clients including the Art Institute of Chicago, the 2nd Istanbul Design Biennial, The Renaissance Society at the University of Chicago, RISD Museum, SALT Istanbul, Vera List Center for Art and Politics, and the Whitney Museum. He is the founder and curator of P!, a critically-acclaimed gallery in New York City’s Chinatown that experiments with the conventions of exhibition-making. Since opening in September 2012, P! has mounted over thirty exhibitions with artists and designers such as Åbäke, Mel Bochner, Judith Barry, Katarina Burin, Heman Chong, HOWDOYOUSAYYAMINAFRICAN?, Elaine Lustig Cohen, Aaron Gemmill, Mathew Hale, Michal Helfman, Leslie Hewitt, Karel Martens, Luna Maurer/Moniker, Brian O‘Doherty, Sarah Oppenheimer, Amie Siegel, Société Réaliste, Philippe Van Snick, Wong Kit Yi, and others. In addition, Krishnamurthy has coedited books such as MATRIX/Berkeley: A Changing Exhibition of Contemporary Art (Project Project with Elizabeth Thomas, DAP, 2008), Speculation, Now (with Vyjayanthi Rao and Carin Kuoni, Duke University Press, 2015), and Draw It With Your Eyes Closed: The Art of the Art Assignment (Paper Monument, 2012). Krishnamurthy is the associate editor of the art journal Paper Monument, and serves on the board of directors of the journal Triple Canopy and the advisory board of the Vera List Center for Art and Politics at The New School. Having lectured and taught widely, he is currently on faculty at the Bard College Center for Curatorial Studies. Cay Sophie Rabinowitz is the director of OSMOS, which delivers unique contemporary perspectives on design and the visual arts. Rabinowitz has published books and articles on visual art and curated numerous exhibitions. She was cofounder and editor of FANTOM Photographic Quarterly (2009–12), senior editor of Parkett magazine (1998–2007), and has served as artistic director of Art Basel and as a faculty member in the graduate programs at Parsons, The New School for Design, and Columbia University. OSMOS Address is a project space for exhibitions and programs in an East Village storefront that was once frequented by Emma Goldman and other radicals. Designed by Leong-Leong, the venue functions as a platform for the international exchange of ideas and images. OSMOS was initiated fifteen years ago with a project space in Berlin and thrived for a decade as an ambulant and integrated concept for curatorial and editorial activities.